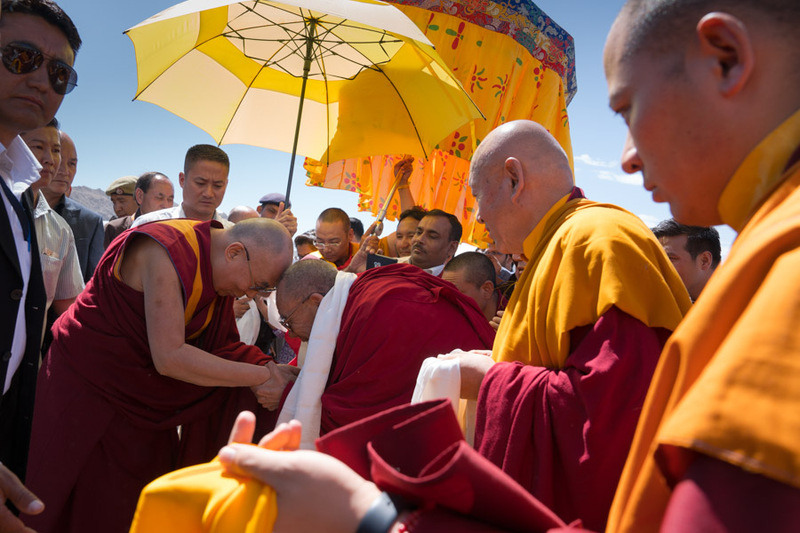 (TibetanReview.net, Jul27, 2016) – Tibet’s exiled spiritual leader, the Dalai Lama, is to spend nearly a month in Leh, capital of the Ladakh region of Jammu and Kashmir state of India, beginning Jul 25, taking rest as well as giving religious teachings. The Dalai Lama will give his first teaching on Aug 12 on Atisha’s Lamp for the Path to Enlightenment (jangchup lamdon) and Nagarjuna’s Commentary on Bodhicitta (jangchup semdrel), with the venue being Thiksey Monastery. On the following day he will confer a long-life empowerment (tsewang) and be offered a long-life prayer at the monastery. Later over Aug 19 -20, the Dalai Lama will give a teaching on Shantideva’s Guide to the Bodhisattva Way f Life (choejug), with the venue being the Shiwatsel Teaching Ground. Then on Aug 21 he will confer an Avalokiteshhvera Initiation on the same venue. The Dalai Lama returns to Dharamshala on Aug 22.